‘Food waste is big — literally. We know that it amounts to over £20bn effectively thrown away in the UK each year. In Camden, where I am a councillor, over a quarter of what gets chucked into the household bin is food. At Camden we recently began a campaign to highlight this problem, and so I was intrigued to hear of the work of the Felix Project. Camden residents can already send their food off to actually help generate electricity (really!). But what of businesses in Camden with food left over at the end of each day? There is more than one way to make sure we don’t waste our food. Recycling and composting is one, but redistributing it to those who’ll make use of it — as the Felix Project does — is another. Heading out one evening on the Project’s Camden route, I was fortunate to see first hand what the cafes and shops that take part in the scheme were able to give us. Visiting Pure Food, Gail’s Bakery, and Whole Food Market we collected sometimes nearly everything they had left. Sometimes the outlets selected items that were more than fine for consumption but would not last too much longer. There was certainly a lot of bread, but we also managed to pick up a decent amount of fruit and other foods. The businesses’ staff were familiar with the regular visits from the Project and seemed pleased to be able to participate. 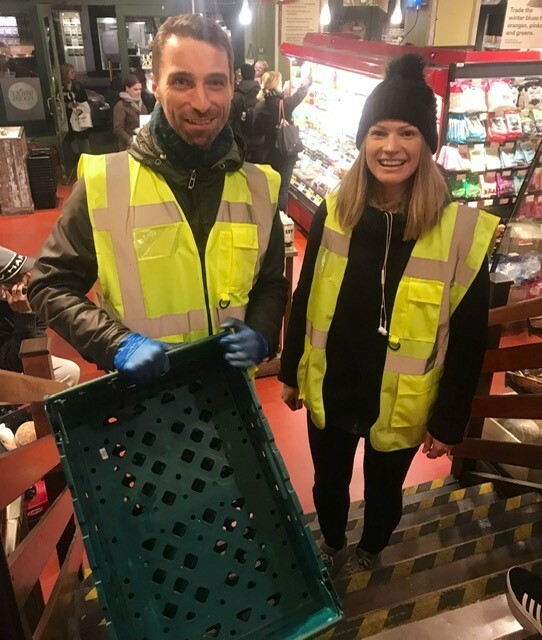 Homeless shelters in Euston and Marylebone took in much of what we picked up; and it was fascinating on another level to see inside some of the places that Camden Council’s homeless outreach team refer people to. My central London ward now has large numbers of rough sleepers; joining the dots between the food outlets and the shelters who can benefit is just one part of helping improve things in these difficult times. It is not just homelessness charities who can take part, though. Greenhouse Sports in Westminster also took in a lot of — as I say, plentiful — bread that we had collected, ready to make sandwiches for the young people they work with. In a way what I saw was what I expected: a lot of wasted food at the end of each day. But it is was interesting too to hear volunteers observe that they felt that over time their partners were reducing the amount of food that gets left. Which is a good thing, of course, while also another motivation for the Project to seek out new partners. If you are Camden food outlet or charity the Felix Project is looking to increase the amount food rescued in the borough and would love to hear from you. Or if you’d like to volunteer or find out more please get in touch HERE.